About fifteen minutes ago ended first finale of Polish „X-Factor”. And… well, the score wasn’t a suprise. I think not only for me but for everyone who were watching this from the beginning. Because… who, except Gienek Loska, earned for the victory? He got fame because he didn’t agree for rules of “Got Talent” and he favoured go away than do something in spite of himselfs. Those time everyone were talking only about him. Now the same thing is happening. He’s normal boy from the street – well, maybe a little bit older than a boy, but still. 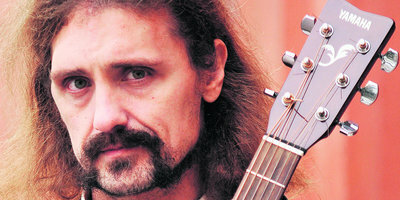 Like Kuba Wojewódzki, one of the jurors, said: “Gienek is polish American’s dream – usual street musician TRAFIA on the platform”. I guess, Loska wasn’t pretty sure he really wanted to be in programme like this – more! A lot of people didn’t want it for fear of Gienek will lost his simplicity and all this what people loved in him – genuineness. But he didn’t change. He’s still the same Gienek, who comes in the stage, clacking his foot in the floor and looks like… he’s got everything somewhere. Gienek was fascinating us in every single episode of “X-Factor”. Even if were some moments when seemed like everything was all the time the same, even if sometimes there was no original, he still was arousing emotions and impossible was wasn’t love him. Every day, in normal life, Gienek is a husband and father of seven years old girl, and we can still meet him on the streets of Warsaw. We can throw into his wrapper some coins and listen his raucous voice. I think people love this. Because the worst thing is swagger and overconfidence… And it’s not important that just this confidence is one of the most important things for the artist. People love normal, forthright guys – I don’t know, maybe it’s because of our Polish jealousy – when somebody succesed we have to hate him… Unless, he’s still the same person, he’s not changing in jumped-up super-star. True is… even if he hadn’t won this programme, he would still be the winner.